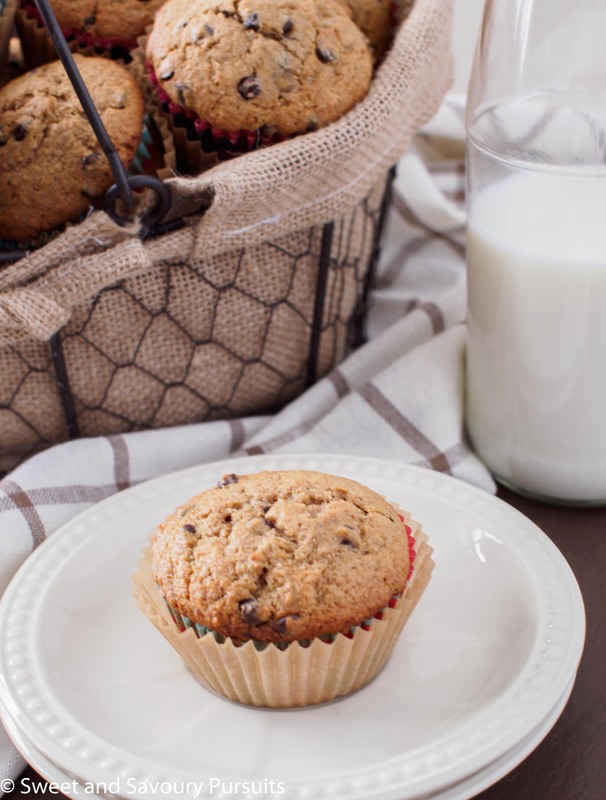 These Browned Butter Whole Wheat Chocolate Chip Muffins make a delicious and wholesome breakfast. Looks like my girls are developing a taste for baking, so when they asked if we could bake something together I thought it would be a good idea to make some muffins. For me, this meant the muffins would have to be healthy, for my girls, it meant that there would have to be some chocolate chips in them. 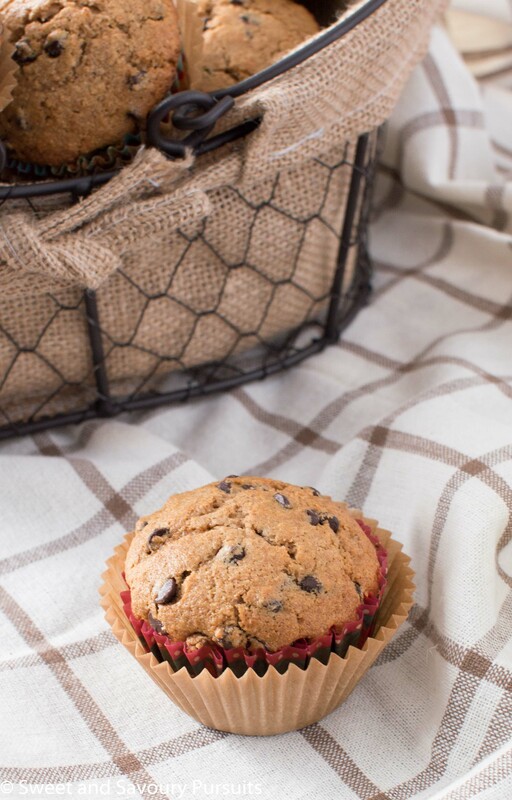 After some searching on the web for a chocolate chip muffin recipe, I found this simple recipe from Joy of Baking. I’ve been wanting to try baking with browned butter so I adapted her recipe to include browned butter and whole wheat flour and reduced the sugar content. And so my girls and I made these Browned Butter Whole Wheat Chocolate Chip Muffins. The kitchen always gets a bit lot messier when working with my girls but we have lots of fun. We each sampled a muffin and came to the conclusion that they were delicious! The flavour of the browned butter really came through in these muffins and added a nice nutty flavour. In a saucepan over medium high heat, melt butter. Stir the butter occasionally so it cooks and browns evenly. When the butter starts to smell nutty and is browned remove it from the heat, transfer it to a bowl and let it cool. In a large bowl, whisk together the flour, brown sugar, baking powder, cinnamon and salt. In a separate bowl, whisk together the milk, eggs and vanilla. Add the wet mixture and the melted and cooled browned butter to the dry ingredients and mix until just combined. Stir in the chocolate chips. Don't over-mix the batter or you will have tough muffins. Evenly spoon the batter into the greased or paper-lined muffin cups, filling almost to the edge of the muffin cups. Bake until a toothpick inserted in the centre of the muffin comes out clean about 18-20 minutes. Let the muffins cool in the pan on a rack for 5 minutes before removing them and placing onto a wire rack to cool completely. Wow, you’ll have to share your secret, how do you manage get your kid to help you clean up? aww, your kids are the cutest!! These muffins look great! nice job on the photos as well! A very nice and healthy recipe. Love love loooove your pictures. Very talented you are. I love anything with brown butter, these sound amazing love that they are made it whole wheat! Thanks! Yes browning the butter truly makes a difference. Wow these look so simple and wholesome, I love it. They remind me of muffins my mom makes, just no nosense and delicious! Thank you, yes very simple to make and delicious. Yes it is. I hope they will keep good memories of those times. Thanks for stopping by. 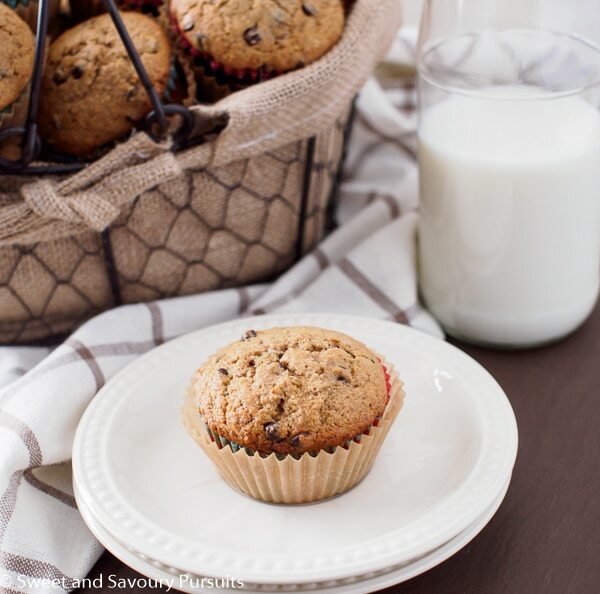 Super-healthy whole wheat muffins. Looks fabulous!